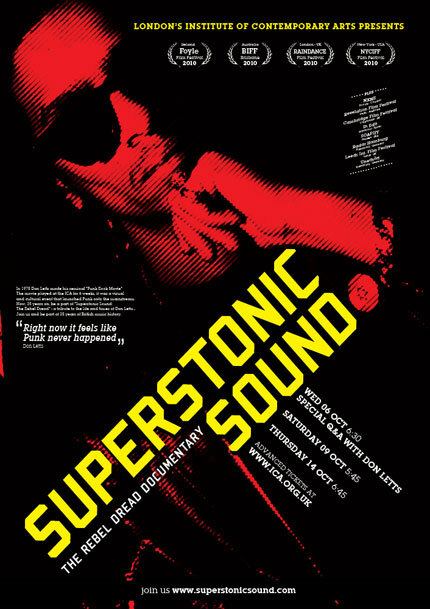 “Superstonic Sound: The Rebel Dread” is a new documentary by Raphael Erichsen & Edward Dallal which profiles the legendary Don Letts. As a member of Big Audio Dynamite, director of “The Clash: Westway to the World” and “Punk Rock Movie,” and hundreds of music videos, the film documents Letts role in helping to merge reggae with punk. Letts remains both an active musical and film making force and a highly memorable character. He may be best remembered for the famous picture of him walking by himself towards a line of riot police that was used as an album cover by The Clash on 'Black Market Clash'. Following in Letts footsteps is his 24-year-old son Jet Letts, an aspiring DJ and producer of dubstep, which is a musical genre that is a direct descendant of the dub and reggae championed by his father and his grandfather (who started Superstonic Sound System as the very first reggae sound systems in the U.K. when he arrived from Jamaica as an immigrant). As such the documentary traces the Letts family musical heritage that mirrors the history of Dub, Reggae and Punk and its direct influence on 80's and 90's pop, Hip Hop and Dubstep. The doc has been making its way around the world via screenings at a number of important film festivals (most recently at the San Francisco IndieFest in mid-February) and has been receiving good reviews (read a few here and here). Watch a preview clip below and definitely go see the film if it is screened where you live. Superstonic Sound: The Rebel Dread (Trailer) from Edward Dallal on Vimeo. Apologies! The film was available for FREE viewing and then suddenly it was password protected overnight.